The Shell Ocean Discovery XPRIZE, a global competition challenging teams to advance breakthrough technologies for rapid and unmanned ocean exploration, recently announced that 21 teams across the world will advance to compete for the competition’s $7 million prize. 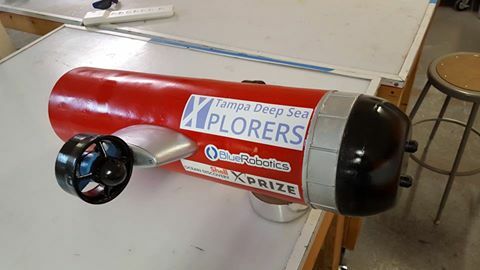 Tampa Deep-Sea X-plorers has passed the first milestone and is one of 21 semi-finalist teams who will test their deep-sea mapping technologies in Round 1 in September 2017. Teams will deploy their entries to operate at a depth of 2,000 meters, racing to map at least 20 percent of the 500 km2 competition area at five meters resolution, identifying and imaging at least five archaeological, biological or geological features at any depth, all within 16 hours. In other words, the competition technologies will aim to reach depths deeper than the Grand Canyon and map an area that is nearly five times the area of Paris. The Ocean Discovery XPRIZE competition will be held in 2 phases, one year apart and will award up to $7 million in cash prizes to the qualifying teams who are best able to develop and demonstrate one or more autonomous underwater vehicles (AUVs) to map a 500 km2 section of ocean bottom to a depth of 4000 meters. The winning team will be announced in December 2018. Congratulations on being selected to compete in round one of the Shell Ocean Discovery XPRIZE in September 2017! Best wishes that your team will earn 1st prize!